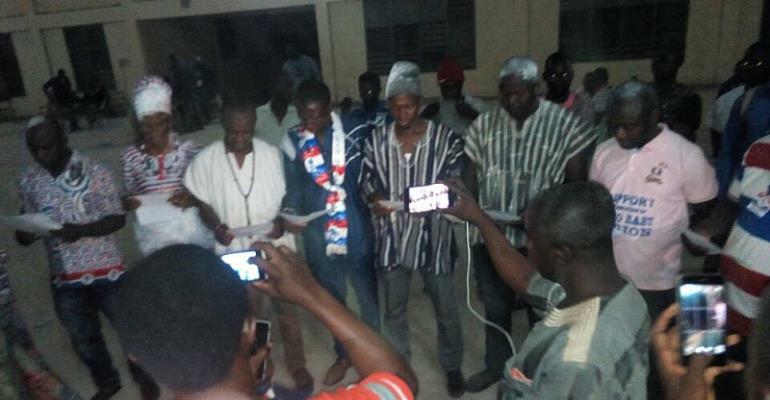 Twenty-six out of the 29 constituencies of the New Patriotic Party (NPP) have successfully elected new executives to over-see the effective day-to-day running of the party at the constituency level. Two constituencies – Sunyani East and Asutifi South – could not go through the election process as a result court injunctions while the party itself has put on hold elections in the Techiman North Constituency due to some internal issues. Modernghana’s interactions with the various constituencies where the elections took place show that the exercise was generally peaceful as no major infraction was recorded. At Kintampo, capital of the Kintampo North Constituency, Abubarkar Sadik won the chairmanship race while Living Man emerged as the First Vice; with Rahim Seth winning the Second Vice Chairman slot. The other executives are Dauda Mohammed, Secretary; Bro. Biako, Assistant Secretary; Abraham Dapaah, Organiser; Rosemary Effah, Women’s Organiser; Nancy Boateng, Treasurer; Joseph Nanga, Youth Organiser and one Bob as the Nasara Co-ordinator. At Jema, the incumbent Chairman for Kintampo South, Opoku Nyame retained his seat with Kwaku Asare and Isaac Kumayi winning the First Vice and the Second Vice positions respectively. Seidu Liman was chosen as the Constituency Secretary while the Assistant Secretaryship position went to Opoku Mensah. The position of Constituency Organiser position went to Suleman Musa while Janet Asamoah emerged as the Women’s Organiser. Bright Adu Apau was elected as the Youth Organiser while Sule Berma won the position of the Nasara Co-ordinator. Reports from other parts of the region speak of orderliness in the conduct of the elections across the Brong Ahafo region. The Deputy General-Secretary of the NPP, Nana Obiri Boahen and some other Regional Executives of the party visited some of the constituencies to monitor the exercise and help resolve any challenges that might have arisen in the process. At the time of filing this report, no complaint of election rigging had been lodged at the party office in Sunyani. “Everything went on peacefully, no acrimony and no complaint about election rigging or any malpractice whatsoever. We are very happy about the outcome”, a party stalwart at Kintampo told the modernghana.com in an interview after the elections.